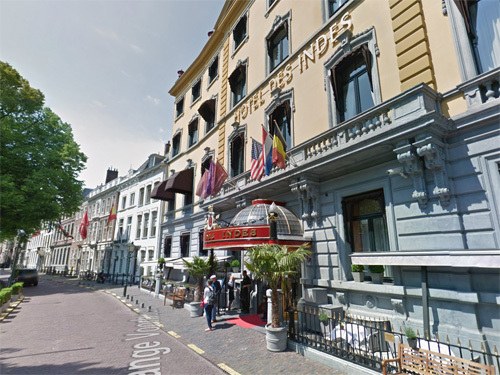 Hotel Des Indes is a hotel at the Lange Voorhout in The Hague or Den Haag. It was built in 1858 a a family house. From 1881 a hotel is located in the building. 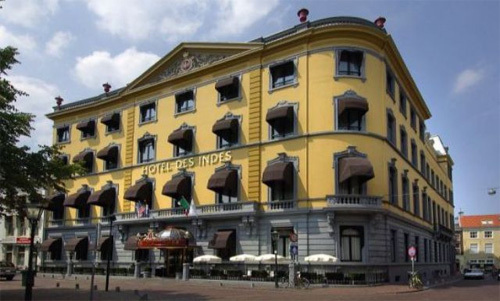 Hotel Des Indes is located in a beautiful area in the city centre of the Hague. The surrounding buildings make up the government and diplomatic district. Visit the Royal Art Gallery Mauritshuis to see the works of Vermeer and Rembrandt or the Escher Museum located in the Winter Palace, both within walking distance of the hotel. The palace was built in 1858 for W.D.A.M. Baron Brienen of Groote Lindt (1814-1863), a personal advisor of King William III, who was often in The Hague. The baron bought three houses on the site of the Lange Voorhout and the Vos in Tuinstraat and demolished them. One of them, was the William II museum, which stood on the corner of the Denneweg. 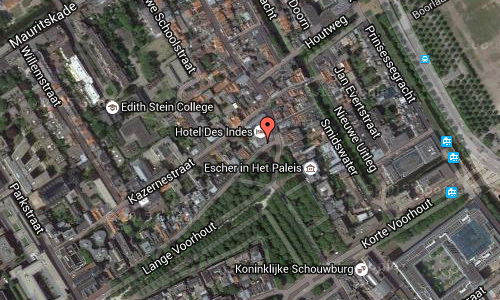 In this place he built a palace for the sum of 150,000 guilders by architect Arend Roodenburg. The baron would have a palace in the Hague there to give parties. The house had a spacious courtyard, stables, servants and private residences and a magnificent ballroom. One could by the current entrance to the carriage drive inside, and then the coach at the roundabout could, where high tea is served now, turning to leave the premises again. After the death of the baron in 1863 it came into the possession of his son Arnold, but four years later the building was sold. The palace was owned by hotelier Paulez who gave it to his daughter, she made with her husband Friedrich Wirtz a hotel. The palace underwent a four-year renovation and was opened on May 1, 1881 by Prince Frederik, the uncle of King William III. The hotel had 120 rooms in the early years, there was only one bathroom per floor, but at that time was already a luxury. 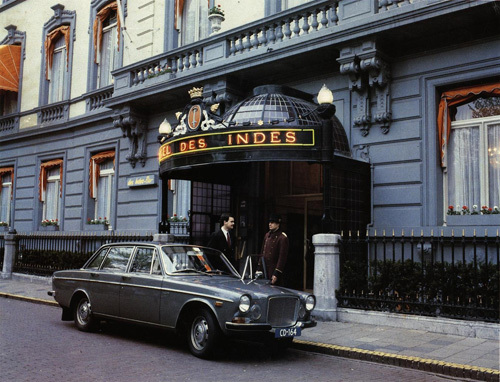 Des Indes was true back then as a hotel with sophisticated elegance. The early years spent a lot of lavish parties and exclusive banquets. The hotel also had difficult times, but then in 1899 the first peace conference was held on the initiative of Tsar Nicholas II, in The Hague, took the arrival of many diplomats and government leaders for a significant upturn. In 1896, C. F. Haller followed director Wirtz, and this was followed in 1914 by Mrs. M. F. Haller-Rey and her brother Monegasque Jean-Jacques Rey. However, the First World War threw a spanner in the works, and the hotel almost went under. 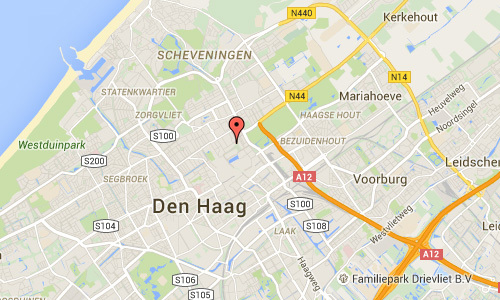 In 1918 the shares for 1.25 million guilders were taken over by the Dutch Export Company (N.U.M. ), who wanted to establish an office in the building. At the behest of Mayor J.A.N. Patijn the palace, however, was (with a small profit: 85,000 guilders) sold to the Dutch State, so the property could remain as high quality hotel. Rey was appointed as manager. In 1971, threatened to close the hotel. Prime Minister Biesheuvel, who, like Schmelzer and Tilanus almost weekly ate their lunch there, would dine there for the last time with his ministers on 27 October 1971. They decided to act and in 1972 Julius Verwoerdt took over the operation in hand. Soon after Verwoerdt bought the property from the State of the Netherlands for 1.38 million guilders. Under the leadership of an old relationship Verwoerdt, Altkemper construction coordinator and director Hans Haan later years took an intensive renovation site. The antiquated coal furnace was replaced in the restaurant kitchen and the barely functioning central (steam) heating. The total electrical wiring was redone after which the remaining funds to the famous central hall and rooms were refurbished. In 1979 Verwoerdt sold his shares in the now grown to 13 hotels and led by Gerard van der Veen standing hotel empire to the British hotel subsidiary of Bass Breweries Crest Hotels. In 2004 the hotel had 76 more rooms. Since January 2003 the hotel is part of the hotel chain Starwood Hotels and Resorts Worldwide, under the name of The Luxury Collection. In this chain are also among others Sheraton, Le Meridien and St. Regis. This hotel group has carried out a complete renovation of the hotel, which added an extra floor in 2005 and 2006. The white facade is painted yellow. Shortly before the summer of 2006 the hotel opened up again. The French interior designer Jacques Garcia, responsible for the design of the new interior. More information on www.hoteldesindesthehague.com and nl.wikipedia.org.